Annie Clark performed “New York” and “Los Ageless” on Stephen Colbert’s show. 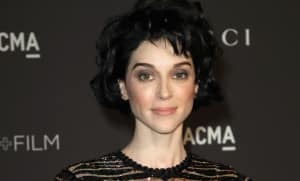 St. Vincent is gearing up to release her eagerly anticipated new album MASSEDUCTION on October 13. on Wednesday night, October 4, she appeared on The Late Show to perform the two singles released from the record so far in "New York" and "Los Ageless." Both performances were elevated by inventive staging, with Annie Clark delivering the heavily distorted "Los Ageless" in front of three pairs of boots kicking through a thick red theatrical curtain. The tender "New York," meanwhile, saw Clark perform with a masked pianist with a shocking yellow backdrop. Check out both performances now.